Willard Metcalf was a member of the Ten American Painters, a group that withdrew from the Society of American Artists in 1897 and exhibited their work together for the next twenty years. He is known for his depictions of American coastlines and domestic interiors. 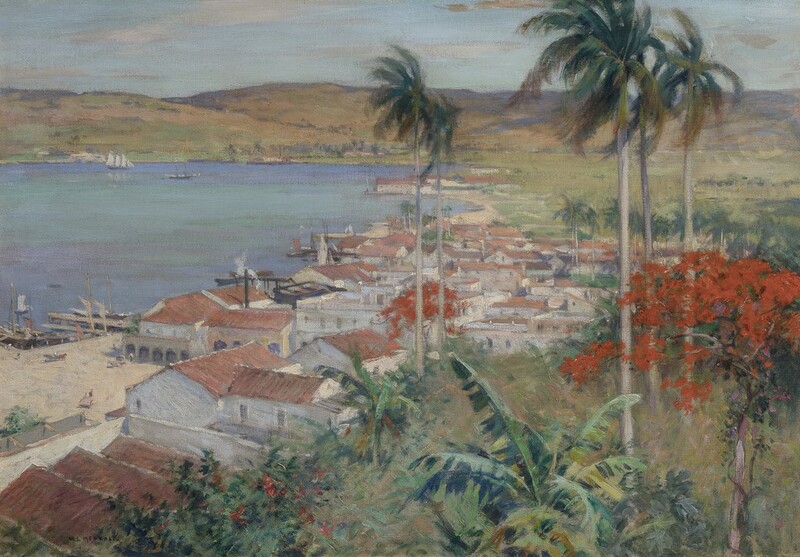 In Havana Harbor, he turned to the theme of tropical exoticism, painting the Cuban port and its lush environment from a hillside. The rapidly applied touches of color exemplify Metcalf’s embrace of an impressionistic technique. The work was originally part of a series of paintings Metcalf created to complete the interior decor of a new luxury store opened by the Havana Tobacco Company in New York City. The artist traveled to Cuba in 1902 for this project, which sought to contrast the elegance and sophistication of Cuban cigars with the domestic products sold by the rival American Cigar Company.